For Elvis 1974 was an emotionally turbulent year. This was his sixth singing to the Las Vegas casino audiences, still doing 2 shows a night, and he was really feeling the loss of Priscilla. The dinner shows were beginning to bore him (people rattling cutlery) and who could blame him? Yet this inner turmoil helped produce the most fascinating Las Vegas season of his career. He gave some of his longest performances and with an incredibly varied set-list. The season started with some exceptionally good shows yet somehow Elvis managed to hit an all-time low by September. However when he was in a good mood, his voice sounded better than ever and the shows were excellent. RCA must have kicked themselves because Elvis, for the last time, introduced a new set list here yet they had only just released the 'regular' set on the March 'Live on Stage in Memphis' LP. On Opening Night Elvis bravely dropped many of his standard repertoire introducing a bunch of new songs & great oldies like 'Down in The Alley'. Sadly the audience just wanted the same old fare and showed lacklustre response and by Show 2 Elvis had gone back to his basic set list. Opening Night is featured on the ‘Nevada Nights’ FTD. This concert is the 11th show of the season. 'See See Rider', 'I Got a Woman', 'Love Me' & 'If you Love Me' are all ok versions where Elvis is warming up but track 5 is where the real interest starts. Elvis has already announced that he'd like to swing on a vine, like Tarzan, to get up to the balcony so you know he's on good form! 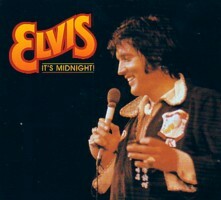 'It's Midnight' was recorded the previous December but had only just been released and Elvis mentions it as his new single. His voice is warmed up by now and he sings a lovely, affectionate and deliberate version. 'Big Boss Man' sounds fine (thankfully a newly introduced song that he didn't drop) and a great 'Fever' follows. Elvis has a lot of fun with the words (which works!) and is obviously having fun on stage - After the line "She said Daddy oh don't you dare".. he sings "She had a deep voice" (instead of "He gives me Fever") - clever & it fits perfectly! 'The Wonder of You' is rare for 1974 and Elvis confuses the band by coming in late. 'Softly as I Leave You' is a delicious version and you can hear the really appreciative audience response. 'Spanish Eyes' is a nice surprise with Elvis and Sherrill Neilsen duetting and is a real highlight. This would be the very last time Elvis sang this song on stage - and the only time he sang the song in this whole season! I even like the version of 'Hound Dog' that follows where Elvis plays delightfully with the start (you can really hear the echo of the showroom) and the band play it funkier than usual. 'You Gave Me a Mountain' is fascinating as in '74 Elvis was certainly struggling with a few Mountains of his own. This makes it very relevant and an interesting listen - In the final show (the 'Desert Storm' bootleg) Elvis denied that this song had anything to do with his personal life but then directly sings it to Priscilla! However Elvis is in a chatty mood and for once even the 'Introductions' are fascinating! Elvis explains to the audience how he + Red climbed over fences to paint the Showroom's 'Fat, funky angels' black! - This nicely shows that the wild boy spirit of the 50's was still within him. There is also some more funny dialogue where Elvis laughs and, believe it or not, mentions 'Stay-free' pads and explains what he uses for nosebleeds! He then slams into another gem, the funky and excellent 'If You Talk in Your Sleep'. This was his last single released in the USA at the time (made the top 20) and the band do a great call & response, making it a real highlight of the CD (Funkier & better than the 'Live in Las Vegas' version). At this point the original tape ran out and the CD is completed with the Aug 29th Dinner show. 'Why Me Lord', 'Teddy Bear/Don't Be Cruel' are given the regular work-outs but we're back on track with a great version of 'How Great Thou Art'. This song understandably won him a Grammy in 1974 and shows off his beautiful, rich voice. Elvis also introduced Olivia Newton John's songs 'If you Love Me' and 'Let Me Be There' into his shows in 1974, not my favourites I admit, but Elvis is really enjoying himself and adds a reprise to 'Let Me Be There'. Sung "for my Daddy" 'Early Morning Rain' is sadly incomplete but it is a great version. (Oddly at this point the CD + cover track listing begins to differ by one track). As we head to the end Elvis explains that The Hilton only liked him to perform for 55 minutes but that he's been on for 1 hour 20 minutes already and he's going to sing some more! 'Hawaiian Wedding Song' is a lovely duet and there's more great banter before the final 'Can't Help falling'. 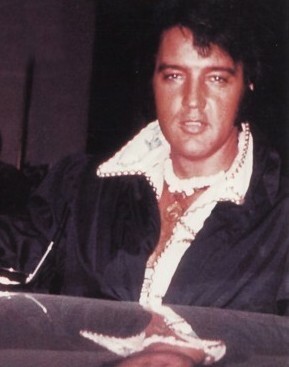 Here Elvis talks about his suit and his diamond rings - "You helped pay for them"!! - all in a friendly tease with the audience and he honestly explains that he loves being on stage as it's "My life blood and I love it". Verdict - Overall, maybe we don't need more average versions of his oldies and later Las Vegas shows never carried the sparkle you could hear in response from the larger audiences (Dixieland Rocks). However, at 80 minutes, this is an amazingly packed CD with an interesting selection of songs as well as some great dialogue which captures Elvis in 1974 in a far more satisfying way than CD4 of the 'Live in Las Vegas' box set. FTD CD Credits: Compilation by Ernst Jorgensen & Roger Semon.